Three years ago, French researchers declared that a centuries-old mummified head was that of the beloved King Henri IV. But now a new study says, "Non!" The original conclusion was based largely on facial reconstruction techniques and signs the skull had injuries similar to those suffered by the monarch. The new study looked at DNA instead. It found a genetic mismatch between the head and three living male relatives of the 17th-century French king. The researchers concluded the head didn't come from anybody in the royal lineage. Henri IV was one of France's best-loved kings, credited with bringing religious peace to the country and building Parisian landmarks like the Pont Neuf bridge during his reign from 1589 to 1610. He was the first of the Bourbon monarchs and grandfather of the Sun King Louis XIV. It's "impossible" that the head belongs to Henri IV, said Jean-Jacques Cassiman, an emeritus professor at the University of Leuven, one of the authors of the new study. The research was published online Wednesday in the European Journal of Human Genetics. The same study also found a blood sample previously attributed to King Louis XVI, one of Henri's descendants, lacked any royal ties. Louis XVI died on the guillotine during the French Revolution and many spectators reportedly soaked their handkerchiefs in the king's blood. But Cassiman and colleagues found the lingering traces of powdered blood on the handkerchief they tested did not match the Bourbon family DNA. Cassiman said he wasn't sure who the head or the blood sample belonged to. The DNA from both failed to match samples from other royal families on record. Amid the frenzy of the French revolution, the royal tombs at Saint Denis near Paris were dug up and some accounts claim Henri IV's head got chopped off and stolen. Cassiman and his co-authors dispute that Henri was decapitated and believe the king is still buried in Saint Denis after the tombs were resealed in 1817. "That is impossible to verify," said Michael Rowe, a senior lecturer in European history at King's College London, who was not connected to either study. He said there wasn't much evidence one way or the other to suggest what happened to Henri's head. But Rowe said that Henri IV's reputation as one of France's best kings might have saved his body from decapitation. "If the revolutionaries were going to spare any of the kings, it would have been Henri IV." Philippe Charlier, author of the 2010 study that identified the head as Henri IV, dismissed the new research. He said he and colleagues have found an exact match between a three-dimensional comparison of the ancient head and Henri IV's death mask. He said the work will be published soon in a forensic journal. Charlier added there were numerous doubts about the paternity of various kings in the Bourbon line, which might explain why there was no link between the DNA of modern-day descendants and the ancient head. "It is hopeless to try to match a family tree and a series of genetic links (over) such a long period," he said in an email. 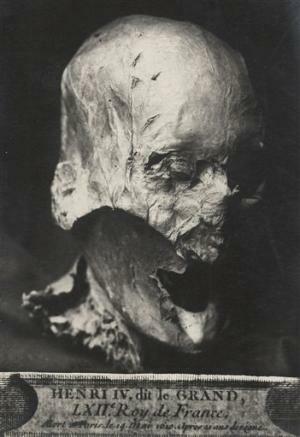 Frank Ruehli, of the University of Zurich and the Swiss Mummy project, agreed there could be questions about paternity in the Bourbon line and also raised concerns about the authenticity of the ancient DNA samples, as he said it was very difficult to get good data from a sample several centuries old. "The best would be to look at (Henri IV's) heart as well," he said. "If you have multiple tissues from the same body showing the same results, that would be a positive identification," he said. Ruehli said given the lack of complete data, it was impossible to know for sure whom the head belonged to. Charlier said the mummified head is currently in a Parisian bank vault awaiting reburial but that there are no exact plans yet.